If I'm ever in search of a good deal on clothes or housewares, I can usually count on one of these three Ross, Marshalls and TJMaxx. But never did I think one of them would be a great place to find make-up. A couple weeks back I took a trip to TJMaxx and found this little gem. they're so different. One has a gold undertone, while the other has a purple undertone. So for my monies (lol) I'm getting six shadows for about $5 each, which is a steal when it comes to NARS. It was hidden amonst a bunch of riff-raff. But I was persistent in my search. The colors are amazingly pigmented and beautiful. So, along with CVS and Walgreens, TJMaxx might have made it to my weekly visit hit list. 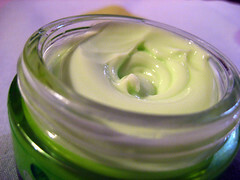 And I also cam across some CHI hair products, along with other high-end hair products. So that might save me a couple bucks when I need to restock on my CHI Keratin Mist or ever decide to try their Silk Infusion. P.S. Follow me on Twitter @KissyFaceMUA. You'll get a chance to know more about me and my ramblings on make-up and more. As of this past Friday, I've finished my last fall semester at UF. The semester had really been trying but with God I pulled through. 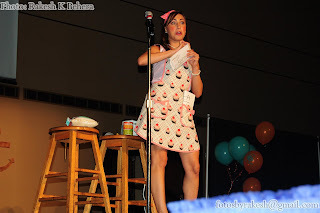 And with this much needed break, I've been opportuned to dedicate some much needed energy to KF and my beloved blog. 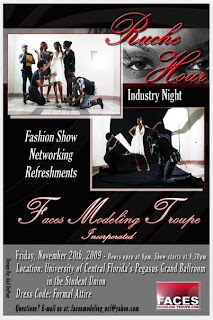 On Friday I was in Orlando doing make at UCF Faces Modeling Troupe Ruche Hour event. I was set do makeup for one designer which included four girls but ended up doing only got to do three of them because of time and I did another young lady that walked in one of the last scenes. 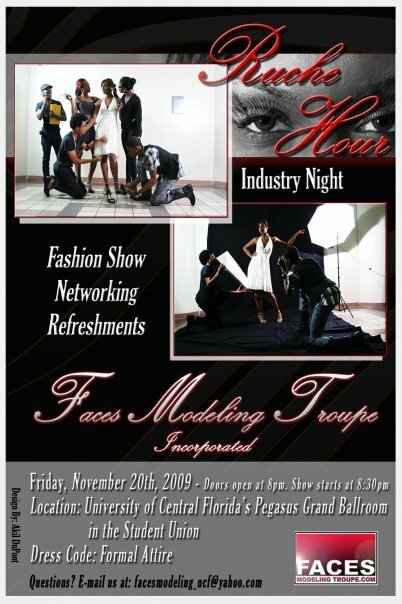 She was apart of the FACES family from USF. She's so sweet. I only got to take pictures of three of the girls that I did though. I did a smokey eye on her using Cinderfella from the Style Black collection. I might have to go back and pick up Guilded by Association. own right now :-/ It looked really darling in person. my Urban Decay shadow palette. Sorry for the undone brows. I was pressed for time. But I loved how this purple smokey turned out. The camera didn't capture the glitter as well as I wanted it too. And as always, with each experience new knowledge is gained. When I did my first girl (she's not pictured) I was just a ball of nerves. I was constantly second guessing myself and what I was choosing to do with her. I knew what I was capable of but with each girl my nerves eased up and I was able to work and really create some awesome looks. 2. Write Down What I Use. Sometimes I don't know what look I'm going to do and I create them spur of them and I instantly fall in love with them ::pat on the back:: I'm thinking that will be important to write it down for future reference just in case I may want to recreate it or change it up for future work oppportunities. The one that i bought from Yazmo is entirely too small. Yes, it is awesome and really sturdy but plain and simply said, carrying extra tools and neccessities in a ziplock bag in my Barneny bag is not going to cut it. I'll probably use that for small shoots or shoots where I'm specifically packing the items that I know I need. My old roommate helped me pack my make-up kit appropriately and I thank her for that. I'm looking to invest in a set of drawers from the container store so I can house all my make-up necessities. That way when I have to pack up my items they're all in one location instead of all over my room. Remember I still am I college student. But I also need to aknowledge that it's not an excuse for poor organization on my part. Precious moments I waste looking for sponges, or brushes or whatever it may be could be better utilized on something more productive. I just had to rock the necklace! Just a quick post from a recent photo shoot. I must say, that I'm in love with this pic. P.S. Next post will be a few things learned from this shoot. Each makeup endeavor is another lesson learned. As promised, I'm sharing the goodies I got from Walgreens last night. I'm really hooked on lips at the moment so those were the things I was drawn to while browsing the make-up aisle. For the most part, I've always been a clear and/or pinky lip gloss kind of girl. So, in a desire to expand my skill set and have fun with some lip color, I was really interested in the lipsticks and the highly pigmented lipglosses. So on with the stash! From L'oreal, I picked up two lipglosses and and two lipsticks. The lipsticks I chose were more fall-color oriented and somewhat safer colors. As for the lipglosses I went for highly pigmented options. Here's a quick swatch of them. It may have been a better idea to do them on my lips. There's always next time. As you can see, Milla's Plum has a more pink nature, while Mulberry leans to more of a purple hue. I wore Undeniable Mauve today. Got some compliments on it too. And it really lived up to its infallible name. If I hadn't eatten, I knew it would last as long it said it would, which highly impressed me. I'll give a more in-depth review later. Even though it wasn't on sale, I picked up a clear lip liner. This is so ingenious! As you can see, it's not exactly clear but I'll see how it works. I'm just excited to not have to match up lipliners with lipsticks and what not. And for the eyes, I picked up two Maybelline Stiletto Lash mascara's. I wore it today and it simply was amazing! After I applied my eyeshadow, I loved the length it gave to my lashes. And with the trick I learned from a recent MAC class, they curled up pretty nicely too. I'm pretty satisfied with my purchases. I may be a Wal-mart girl, but they sure don't have deals such as these. I may make it a habit to check out CVS and Walgreens on a weekly basis and share my finds. Who knows. I stopped into Walgreens tonight just doing some make-up browsing and I came across a great sale that I had to share. ALL L'oreal lip products are BUY 1, get 1 FREE! ALL Maybelline eye products are also BUY 1, get 1 FREE! I'll be sure to share what I purchased tommorow. P.S. I noticed more followers. Thanks for the support. Hope you enjoy what I have to share! 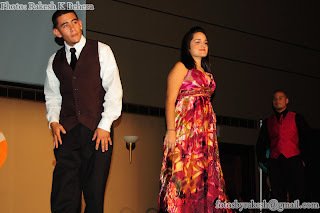 The pics from Friday's Hispanic Heritage Month Pageant came sooner than I expected. So, as promised here are some pics of the women I got to work with on Friday. I tried to choose some photos that really captured their face best. 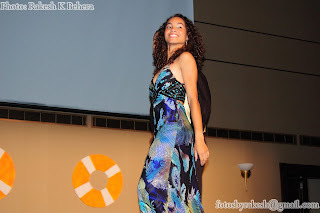 modeling their lovely ensembles and she looked amazing. Also, I forgot to mention my other life saver for the night from a previous post, which was the Notoriety quad from the Make-up Art Collection. The colors worked beautifully on each of their varying skintones. I'll definitely keep it in my "simple and go-to" stash. Oh, and thanks so much to Rakesh Behara for snapping the photo's. His contact info are on the pics. 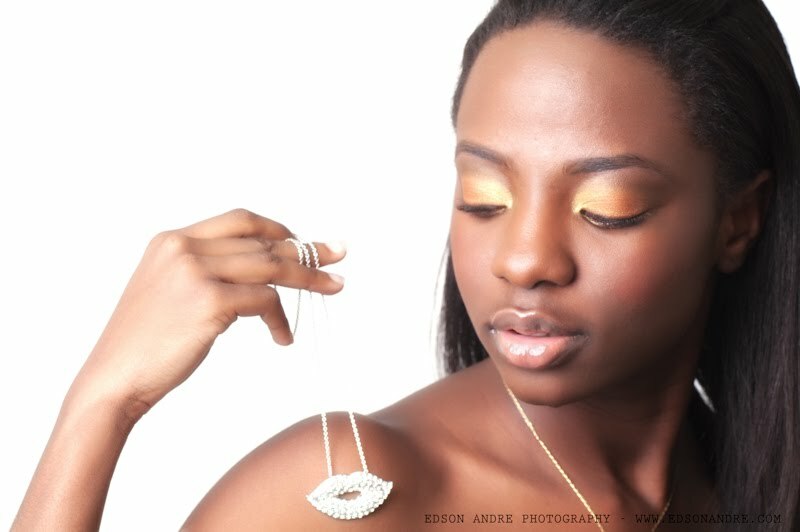 KissyFace Randomosity: Blinged Out Beauty! While shopping for cami's at Forever 21 yesterday this caught my eye. Isn't it adorable?!?!? I didn't expect to find a pair of rhinestone-encrusted lips! I just had to have it! And for only $5.80 i sure did. Typically, I'm not one for bling but at first sight it screamed KissyFace Artistry. 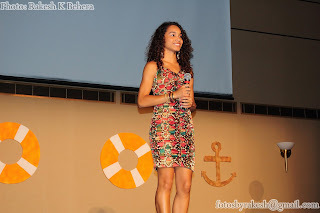 I mentioned Thursday about the pageant I was doing Friday. All in all, it went A-Ma-Zing! From the hours of 2 p.m. - 9 p.m. I got to do about eight girls in total. Six of them contestants, one host and the pageant director. Unfortunately, I was unable to get any pictures because I was working straight through the whole time and during the show when girls wanted subtle changes for their looks. But there was a photographer on hand who was able to snap some pictures of the show. And as soon as I get my hands on them, I'll be sure to post, with his permission, of course. But more importantly I learned a lot of things from this experience that'll carry onto other appointments, shows and make-up opportunities. -It sounds like a no-brainer, but that night it completely slipped my mind. And that's something I'll never forget. Gotta have it! 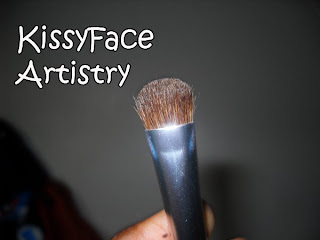 -Like my Sonia Kashuk blending brush and my duo-fibre brush. Love em! 4. Sponges make foundation streaky! -The girls were asking for it a lot. 6. Learn some basic make-up skills for men. 9. Find an online resource for disposable necessities. Working with so many girls, I go through a lot of disposable mascara wands, lip brushes and etc so I need to look into finding places that offer them in bulk at a great deal. And my lifesaver of the day? It was worth every penny. Mixing a few colors here and there created the perfect foundation for these lovely ladies. Overall I loved the experience and would love to work with them again. I truly appreciate you all for reading! Skill Building: Class is in Session! But skip the reasonings cuz I don't want to bore you with the details. This past weekend having a Saturday off, which I haven't had in a long while, I was invited to attend a local M.A.C. class on fall trends. Lol. But seriously she was so down to earth and I must say I picked up a few tricks and scribbled down lots of notes. I love the notepad that they gave us. Really cute! And of course, I couldn't just go to the class. I had to make a few purchases. Welcome to what I like to call my Style Black Triplets. Yes, they are gorgeous. You've all seen the YouTube videos, countless swatches and rave reviews. 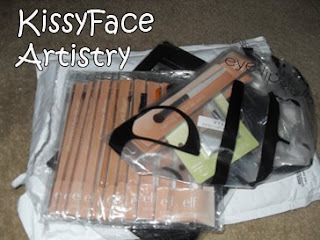 They'll make an awesome addition to my kit for smokey eyes. I can't wait to play in them. P.S. 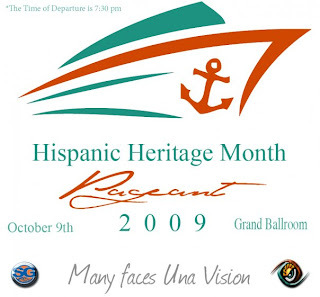 I'm doing make-up at my school's Hispanic Student Association Pageant, which is part of it's month long celebration of Hispanic Heritage Month at UF. So of course expect a post featuring the lovely ladies. When it comes to business, its important to have appropriate ownership so I registered my name KissyFace Artistry for a Web site. I'm loving the journey so much that I just had to grab it up. lol. It's still links back to my blog but, hey, it's a start. I purchased the Web site back in June but with the ongoings of this past weekend, it gave me the gusto to actually put it to use. Doing make-up at this event truly gave me the drive to take the right steps and making KissyFace Artistry as official and legitimate as possible. There's no room for game playing 'round these parts. 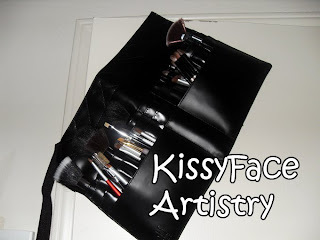 So either using kissyfaceartistry.com or with the addition of blogspot you'll still get the necessary tidbits about the growings of KissyFace Artistry. P.S.S. Welcome to the new followers. It's highly appreciated. There's more to witness, experience and see in the future. That's what you can call me. For the past two weeks a lot has been going on in my life. Not bad but great time-consuming things. But I just wanted to do a quick little post to say, I'm still here. And I should be back in full-effect by mid next week. I have one more exam to knock out before I'm home free. Hope everyone has a safe weekend all. Just had to share really quickly an idea that I'm planning on doing on the blog. As an aspiring makeup artist, I feel criticism is what's necessary for me to enhance my craft overall. So to keep myself motivated and practicing on a consistent basis, I'm going to start a Skill Building Series. This is where once a week I'll focus on executing a look or focus on certain skills of interest. For the next few weeks I'm going to focus exclusively on the face. But before we get into the make-up, what's most important to have is great skin. Aside from a balanced diet (still a work in progress), I turn to vitamins, drinking lots of water and skincare products to keep my skin in tip-top shape. My greatest advertisement for my fledgling business is my very own skin so it always has to be in great condition. So next week I'll be sharing my skin care regime. I'm looking for open and honest feedback. There won't be any hurt feelings, seriously because I'm really here to learn, so share your thoughts. Portfolio Building: Manic Monday to Come! I just made it home from my business finance exam not to long ago. And all I can say is that, it was interesting. lol But enough about academics. Let's get to the make-up. One thing that I need to make sure to have in my portfolio is variety. My roommate has already confirmed to help out along with a previous client. I'm shooting for Monday as the big day but it's yet to be confirmed. So here are the two looks that I have in mind for them. Chiseled to Perfection- a look that focuses on contouring the cheekbones and other assets. And here are some other looks that I"m wanting to do as well. Bold Lips- I really want to do a look where the focus is on the lips. Naturally the go-to color is red but that may change for when I go to create it. Let me know what you think or any suggestions you have in mind for looks that I should create in my future portfolio projects. But in the mean time I'll be spending my free time planning the looks and elements that I want to include because I create better through trial and error. Talk to you lovelies tomorrow! Micheal Jackson was laid to rest today and I witnessed it all on TV. Even though I'm in the younger age bracket I was still a great fan so I'm dedicating this look of the week to him. He inspires me to be the best in my craft. I may not reach the greatness he has achieved but I'll sure do my best. I usually get inspired by colors, flowers, and other artist's work when creating a look. 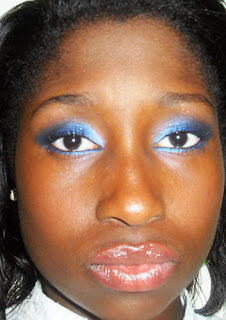 The look I created below was initially it was inspired by a look that Rihanna wore to the Met Costume Gala back in May. I made mine more vibrant and used a greater variety of blues. Finishing Powder: Deep Dark MSF Natural by M.A.C. Upper Lashline- Navy by J.A.N.E. P.S. Follow me on Twitter if you like. I'm a fan of all things social @KissyFaceMUA. 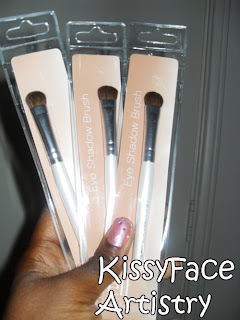 Yesterday, I mentioned the three eye shadow brushes that I purchased from E.L.F. and they are amazing. I'll definitely be adding more to my kit. They pick up color really well and only cost $1. KissyFace Approved? No doubt about it. For such an economical price and great ability to pack on color, there's no reason for it not to. 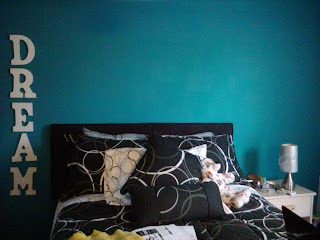 And after cleaning my brushes. I added them to the brush belt. It looks a little empty at the moment, which means I definitely need more brushes or is that another excuse to go shopping? lol. Have a safe weekend and Happy Fourth of July! P.S. I've got some great details to share next week so stay tuned. I'm uber excited. This mini-haul took place at the end of May. It took almost two weeks to get to my house, which was a bit long but after having had them for a few weeks they were definitely a purchase well made. I only purchased three items. And everything was reasonably priced. 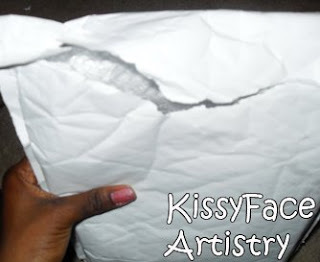 It seems someone else was excited about my package too because when it arrived it had some tears before I got to it. All I can say is hmmmmmmm. But ally my items were intact. 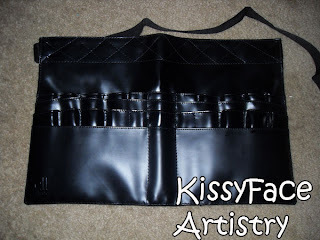 and a brush belt to house my brushes whenever I'm working on clients. P.S. 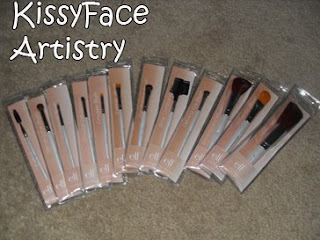 Tomorrow will be a quick review on the brushes that I purchased for myself .